Saint Jude is a powerful intercessor for us in Heaven. He has a lot of devotees in the Claretian order, which I am reading about at the moment. 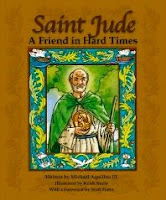 He is patron saint of lost causes, desperate situations and problems almost despaired of. Many people place advertisements in newspapers thanking St. Jude for some particular favour or miracle that he has performed for them. Along with St. Peter, St. George & St. Christopher, he is one of my favourite Catholic saints. PLEASE PRAY TO GOD FOR ME ? Jesus please pray for us ? please pray to God on our behalf to urgently help my oldest son K who is having serious health issues with his back and knees. Please pray for this widow and her children and cats ? Please help my son J and K in their jobs. Please guide/lead US in all areas of OUR lives. Please God help K in the interviews ? PLEASE help us - please pray for God to help us raise the money to pay for my sons knee replacement costs. Saint Jude thank you for ALL the times you have prayed for my family, cats and myself, thank you, we love you. Saint Jude please pray for us ? Dear Saint Jude - THANK YOU FOR ALWAYS HELPING MY FAMILY, CATS AND I. We love and adore you. God to please heal my son KMG's back and knees - as it is has affected his work/employment overseas and we are going to have to pay for his knee replacement and we do not have the medical insurance or cash for same. He is crutches and needs urgent medical attention - he is only 24 years old, help his cat N and allow Kelly to love her and look after her well until my son returns. God please help my family and I with the impending move so that all goes well - legion upon legion of angels to surround, protect my family, cats and I and to be with us during the packing, moving, and unpacking process. please allow us to have a smooth well organised move and allow angels, PLEASE let the pre-paid metre with CITI-Q be registered before we move in so that we have electricity. thank you. God please help my family and I with the impending move so that all goes well - ALMIGHTY FATHER GOD please send legion upon legion of angels to surround, protect my family, cats and I and to be with us during the packing, moving, and unpacking process. please allow us to have a smooth well organised move and allow angels, PLEASE let the pre-paid metre with CITI-Q be registered before we move in so that we have electricity. thank you. Saint Jude please pray for my son K ? The Tax consultant Feky...is not responding to their phone calls - and their payments from IRS are very delayed, they have been waiting since approximately March 2018 and we are desperate now. PLEASE Saint Jude please pray to God so that my son and his friend K receive their IRS tax refunds urgently. Please pray to help him with the Tax refund from IRS, the refund in respect of the trip from Florida to NYC for the new job. Please pray that God makes a way for him to have the operation on his knees and for the funds to be available ?